The Malayan tiger is a subspecies of tiger known by the scientific name Panthera tigris jacksoni. The Malayan tiger is endangered with only 500 left in the wild, but there are efforts underway to protect them from poaching and further habitat destruction. The length of the Malayan Tiger can reach long lengths such as a little less than half of the head/body. In the smallest of details the male Malayan tiger is still always larger. For example the size of the male's paws are even wider than the females. The stripes that are on each one of the Malayan tigers is what makes them uniquely different from each other. The tigers are the only big cats that have stripes. Malayan Tigers can move very quietly and slowly which makes them very stalk and ambush hunters. Their stripes benefit them in many ways especially when hunting. They are then able to hide in the tall grass while they stalk down their prey. Their tongues are as rough as sandpaper, which help them when eating every last piece of the meat from the bones in their meal. The female Malayan Tiger reaches sexual maturity and gains her first litter once they are three to four years old. The male actually reaches sexually maturity a year or two later than the females. The female Tiger usually doesnt get pregnant one after another. She mostly always waits about 2.5 years between each one. Unless she loses a litter then she can produce another one between 5 months. 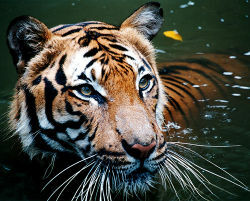 You will only be able to find the Malayan Tiger on the Malay Peninsula and in the southern tip of Thailand. They are found inhabiting the less-dense forests and jungles, where you can find a higher supply of food. The Malayan tiger, next to the Sumatran tiger, is the smallest species of tiger. The smaller size of the Malayan tiger helps it remain unseen in the clear parts of the Malaysian jungle. 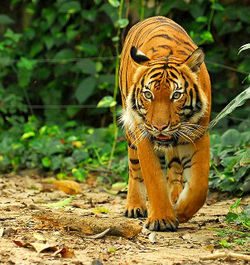 The Malayan tiger was thought to be the exact same as the Indochinese tiger, a large tiger species found in the more northern parts of south-east Asia, and was recently classified as two separate subspecies. This dominant and carnivorous predators hunting technique is stalking it until the Malayan tiger feels it has the opportunity to catch it off guard. The Malayan tigers diet consists of larger mammals such as, deer (their favorite), wild boar, cattle, and goats. The tiger may only make a kill once every three or four days so, when it has killed its prey, it is likely to eat as much of it as possible in one meal. Due to the size and power of the Malayan tiger, their only threat are humans. They do not have natural predators in their native environment. There are approximately 500 Malayan tigers left in the Malay Peninsula. The initial decrease of tigers was primarily because of the large-scale loss of habitat. Recently in has been noted that the largest threat is poaching for its body parts. They are also being persecuted by angry villagers. Due to the fact that their prey is over-harvested, they also are dying of starvation. The most prominent threat to the Malayan tiger is humans. Because the human population is increasing at a fast rate, they most use all this forest space and convert it into agricultural use. When the tiger is deprived of wild game, they seek and attack domestic stock, which leads farmers to hunting them in return. Poachers never give up, and continuously hunt the Malayan tigers for their pelts and body parts. Vietnamese and Chinese traditional medicines rely heavily on tigers. There are villagers that eat tiger meat, perhaps they assume that by eating the tiger meat they will gain some sort of the tiger's power. Malayan cubs playing with a GoPro camera. ↑ Panthera tigris jacksoni Wikispecies. Web. Accessed April 1, 2014. Unknown Author. ↑ 3.0 3.1 Malayan Tiger FunZooMiami. Web. Accessed April 1, 2014. Unknown Author. ↑ Du Plessis, Amelia. Tigers Life Cycle Tigers. Web. Accessed April 2, 2014. ↑ 7.0 7.1 7.2 7.3 Malayan Tiger A-z Animals. Web. Accessed 28 January 2015. Unknown Author. This page was last modified on 8 January 2016, at 15:30.